SAFETY IS OUR #1 GOAL! As a parents of children ourselves, we emphasize safety first in everything that we do. This is why we've partnered with FIN FUN, the #1 USA mermaid tail manufacturer, to provide SAFE + FUN mermaid tails and shark fins. float on back: Able to safely relax/rest in the water when tired. float on front: Able to maitain proper breathing in the water. tread water for 1 minute: This is a fitness test. swim 25 meters: Able to breath unassisted during the swim with no help from the pools sides! swim 25 meters using dolphin kick: This is the basic movement required to swim in a mermaid tail. 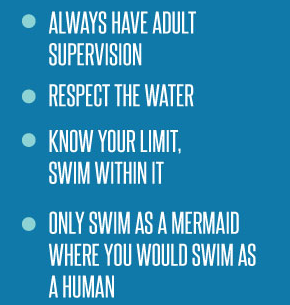 Swimmers should be competent at it before mermaiding.